*The angle of the shower head can be adjusted while using this shower holder. ADVANTAGES OF SUCTION CUP: Vacuum suction cup shower head holder has strong adsorption capacity and it's easy to remove,you can locate it according to your children's height anytime.That is really convenient to your whole family.The adsorption diameter of this shower bracket up to 3 inches which maximum load-bearing up to 3.5KG/7.7 pounds. ADJUSTABLE SLOT: The angle of the shower head can be adjusted while using this shower holder.The slot diameter of handheld shower bracket is 20mm/0.8inch whcih fit 3/4" handheld shower/wands/sprayer.Special 'groove'design of the head makes it grip the shower head firmly,no need worry it fell off. 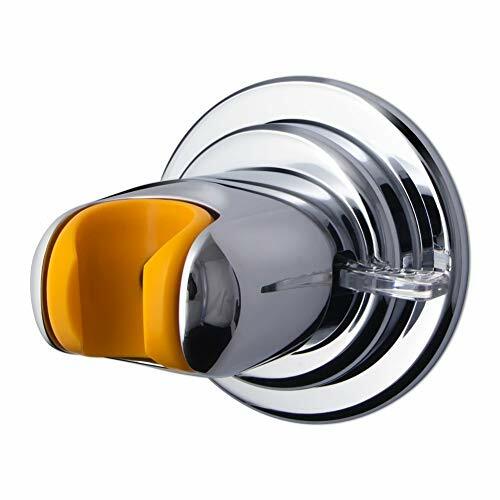 NO DRILLING,NO TOOLS REQUIRED: This wall mount shower head holder is very convenient to install which no need drill your wall,just clean and dry the smooth location,then push the lever in the clockwise direction to make it adsorbs on the surface and push it back to remove it. APPLICABLE INSTALLATION LOCATION: The Holder is suitable for smooth and no concave convex smooth surface such as wood,ceramic tile,metal,apertured ceramic tile surface,etc.ATTENTION PLEASE:If you want locate the shower head holder at irregular surface,please use the adhesive stick disc to avoid falling.provided! MATERIAL: Made of Engineering grade plastic (ABS,light weight but heavy duty ) ,five layers Chrome finish which is hard-wearing,anticaustic and waterproof. If you have any questions about this product by QM-STVR, contact us by completing and submitting the form below. If you are looking for a specif part number, please include it with your message.